Introduction: The Grade 5 Earth Science Unit focuses on the uniqueness of Earth through several of its systems (water cycle and weather) and addresses the California Science Standards for 5th grade Life Science. By the end of the unit students will know the main idea that as the “water planet” Earth is unique. structure and function are related in living organisms. Specifically students will know that: the solar system consists of the sun (a star) and 8 planets; that each planet has its characteristics (including size and distance from the sun) by which it can be described, and that the Earth is the only one with water. Students will also know that water on the Earth allows for life to exist; that the water cycles through living and non living components of the environment; that water cycles as individual molecules and at different rate and from different locations; that the water cycle is a major basis of weather which is the condition of the air around us. Students will know the relationship between density, temperature, relative humidity and air pressure and how those factors impact local weather as well as contributing to severe weather patterns. Throughout the unit, students collect data on weather from their weather station. They analyze the data and make predictions about future weather patterns in their local area. The Grade 5 Earth Science Unit is presented to students through a series of investigations, experiments, active learning experiences, questions, and assessments. Assessments include: pre-, post- and 3 formative assessments. Conceptual Flow Narrative: The Grade 5 Conceptual Flow Narrative for Earth Science: Earth-Our Unique Planet builds on the concepts presented on conceptual flow graphic by describing the concept(s) addressed in each lesson and the links that connect each lesson to the next. Lessons are linked to the previous lesson and the lesson that follows via a conceptual storyline to enable the development of student understanding as they progress from one concept to the next. In Lesson 2, “Planet Relative Size and Distance,” students learn how big the solar system as they explore the relative size and distance of the 8 planets in relationship to the sun in the middle of the solar system. The students use models to make these connections. The students next consider the characteristics in Lesson 3, “Planets Pocket Book.” Through research, students identify special characteristics for each planet and make a book representing their findings. Students share their research and conclude that the Earth has characteristics, which make it unique among the planets. Formative Assessment #1 is aligned to the concepts in Lessons 1-3. As a formative assessment, student answers provide feedback to the teacher and student for any adjustments in the learning. In Formative Assessment #1 students demonstrate their understanding of the solar system, comparing their original drawing from Lesson #1 with what they now know about the solar system. The next set of lessons (4-8) address the water cycle. Students learn that Earth’s water makes the planet unique; they recognize the limited amount of fresh water available for living things; and they understand that the water cycle is more complex than most textbook illustrations. In Lesson 4, “The Water Planet,” students use visuals to explore the amount of water is on the Earth, where it is found, and how much of it can be used by living things. In Lesson 5, “Water Cycles,” students learn that the water on Earth has been here “since the beginning,” moving through a cycle of accumulation, evaporation, condensation ad precipitation. They create a water cycle in a bag to model the cycle. Lesson 6, “ Transpiration,” introduces students to the importance of living things in the water cycle. They learn that animals contribute to the cycle through respiration and excretion. They investigate how plants release water vapor through the process of transpiration. In Lesson 7, “Watersheds” students learn that a watershed is an area of land that drains into other bodies of waters.! They build models of watersheds and compare their models to the watershed in Santa Barbara and Carpenteria. Lesson 8, “The Water Cycle Game,” helps students synthesize their understanding of the water cycle. Students experience a simulation to review the phases of the water cycle and recognize that water travels as individual water molecules that may remain in some locations longer than other places. Formative Assessment #2 is aligned to the concepts in Lessons 4-8. As a formative assessment, student answers provide feedback to the teacher and student for any adjustments in the learning. In Formative Assessment #2 students draw and write about their understanding of the water cycle. Lessons 9-17 build on the importance of the water cycle as a factor in weather. Through the series of lessons students explore other factors that contribute to weather patterns. In Lesson 9, “What is Weather?” students recognize that weather is the condition of the air around us. 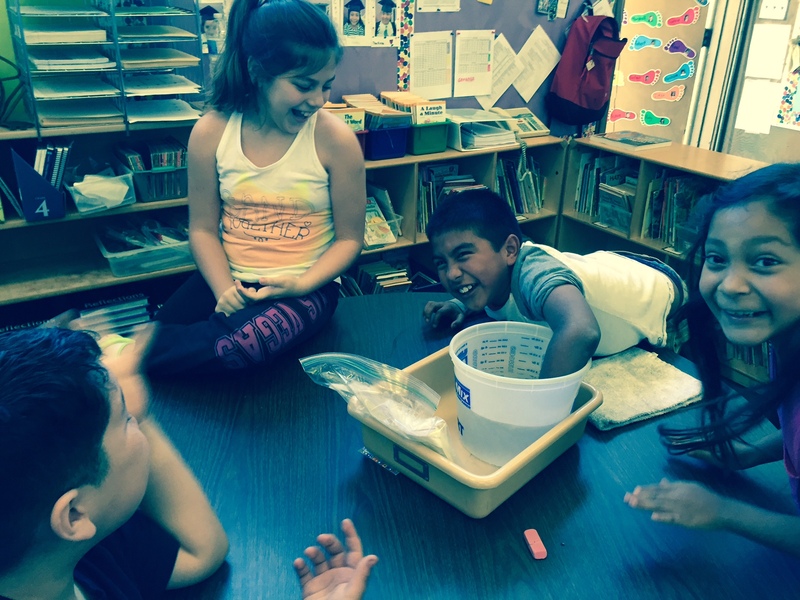 They connect their understanding of the water cycle to weather as they begin their exploration of what weather is and what causes it. They look at types of precipitation. They are also introduced to symbols that are used on weather maps. Lesson 10, “Humidity,” helps students connect precipitation with relative humidity. They recognize that when the air is saturated (has all the water it can hold), fog or rain will occur. The next series of lessons (11-13) help students understand the physical principals that enable winds (Lesson 14). In Lesson 11, “Density,” explore density as a property of matter that is temperature dependent. If the students have done the Physical Science Unit before the Earth Science Unit, they will have done a similar lesson for density and they can build on that understanding. If they have not done the Physical Science Lesson, this lesson introduces density as mass/volume using baggies and cotton balls. It helps students understand how temperature can change the density of air molecules. Lesson 12, “Differential Heating” provides students with an experiment to discover how the temperature of land (sand and dirt), water and air change during the day. Students learn that each is different. They apply this understanding of uneven heating and cooling, and its impact on density, in Lesson 13, “Convection Currents.” Using water as the fluid, students investigate what happens when warm water and cold water come together. They see the current that is established as the warm water rises, filled in by the cold water; and that as the warm water cools, it starts to sink. They infer what will occur in air, another fluid. In Lesson 14, “Winds” students apply their understanding of convection currents to drawings of how wind is created. They explore wind patterns locally. They then use wind maps to explore how winds affect weather patterns globally. Student learn about symbols for warm and cold fronts and apply them to weather maps. Lesson 15, “Pressure” introduces another factor that impacts weather. Using models students build a T chart to combine information that links pressure, density and temperature. They apply their understanding of pressure to reading weather maps with high and low pressure systems. In Lesson 16, “Severe Weather,” students view videos of lightening, hurricanes and tornadoes and research how each of this weather conditions occur. They then create a weather map, showing where these types of weather are most likely to occur and explain why. The last lesson in this unit is Lesson 17, “Analyzing Weather Data.” This lesson is a culmination of the weather data students have collected throughout the unit. In this lesson, they learn how to graph and analyze the data they have gathered. They use this data to make weather predictions for the next month. This lesson can also be used as a performance assessment to measure students’ science process skills. Formative Assessment #3 is given after Lesson17 to see what students understand about winds and reading weather maps because these are two important foci of the current CST for 5th grade. As a formative assessment, student answers provide feedback to the teacher and student for any adjustments in the learning. Upon completion of the 17 lessons, students take a Post-Assessment to determine their overall understanding of the concepts presented in the unit. Are these lesson integrated with language arts? Yes, the lessons are all integrated with science notebooking. Are they aligned to NGSS? These Lessons were written just before NGSS. However, content standards may be transferred to other grade levels and many of the cross-cutting concepts that guide the NGSS are present in these lessons. These lessons have been extremely useful and resonate well with my students! Quick question, though — I am hoping to play the water cycle game with my classes, but the “R3” attachment only contains the die for the river station. Do you have a file with the other 8 dice/cube labels? I could create something similar from scratch but would hate to reinvent the wheel. Thank you again for these great resources!